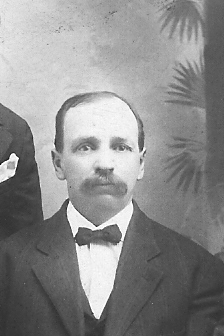 Comments: George F. Somes (Nee: ) | Pueblo CO USA | 1851-1900 | Comments: George F. Somes, (1859 IL-1925 IL) George survived the Chicago Fire of 1871. He was a paper boy selling papers downtown when the fire struck. This picture is p/o a family photo taken prior to 1892. Family moved to Pueblo, CO ca 1896. George returned to Chicago Hts ca 1910. Widowed from marriage to Josephine Bell Embree, elsewhere on site.